I braised pork belly and sato-imo (taro) in my soup & stew donabe, "Miso-shiru Nabe". This donabe does wonderful braising. 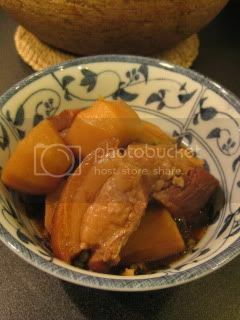 It's a (Japanese) classic-style braised pork belly with the soy-based broth, which is finished with some sansho berries (Japanese mountain pepper berries, "mi-sansho"). To flavor the broth, I also used some Okinawa black sugar, which gave another depth in the dish. The meat was so jiggly and melted in my mouth. 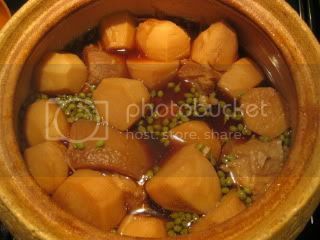 Donabe-braised pork belly is such a wonderful comfort food for the winter, or anytime of the year. 1. 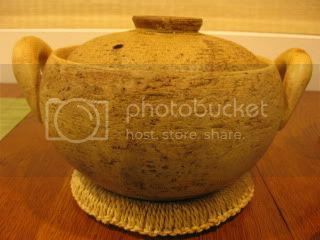 In a medium-size pot, combine good amount of water and sato-imo. Bring to simmer and blanch for a couple of minutes. Drain and rinse. Set aside. 2. In a large saute pan, brown the pork belly all sides over medium+ heat. Transfer to a colander and pour some boiling water over the pork to remove excess grease. 3. In "Miso-shiru Nabe", combine the above pork, 2 cups of water, sake, black sugar, and mirin. Line the surface with a piece of foil. Braise in the 350F oven for 2 hours or until the meat is just tender. 4. (optional - you can skip this process if you are okay with a lot of fat released from the meat in the broth) Once it's cooled down, transfer the pork to a bowl. Cover and set aside (in the refrigerator if keeping it over a few hours). Transfer the braising broth to a separate bowl. Refrigerate it until the fat becomes solid on the surface. Remove the fat solid from the broth. Combine the broth and the pork back in the donabe. 5. Add the soy sauce, blanched sato-imo, and ginger. Simmer over stove-top for 25-30 minutes. Add the sansho berries, turn off the heat, and let it rest for 10 minutes. 6. Serve into individual bowls with condiments.